These September National Holidays may not be well known, but they provide so many reasons to celebrate as a family! September 4th – Newspaper Carrier Day: Do you know your newspaper carrier well? Even if you don’t, it’s a nice gesture to put a little “Thank You and Happy Newspaper Carrier Day” drawing on your mailbox to show him/her that you appreciate the hard work. Your kids will have a lot of fun using their creativity to draw & color something special. Everyone loves the September National Holidays that include fun crafts! September 7th – Salami Day: Your children can help you think of fun recipes to celebrate this silly day. Perhaps a salami pizza or a new sandwich creation – anything goes on Salami Day! September 12th – Video Games Day: The best kind of September National Holidays are those that involve fun game ideas! Have a fun video games championship at home with the kids and test your best game skills. September 13th – Kids Take Over the Kitchen Day: This may be a bit of a scary thought, but why not let your kids be in charge of supper for the night. You’ll have to help them with cutting, the stove, etc. but they can use their creativity to come up with a new recipe and then bake it with a little help from mom & dad. September 16th – Stepfamily Day: Do you have step-sibilings or stepchildren? This is a great day to celebrate your family and it uniqueness! September 19th – Talk Like a Pirate Day: Aye Matey! The September National Holidays wouldn’t be complete without a day of pure silliness! 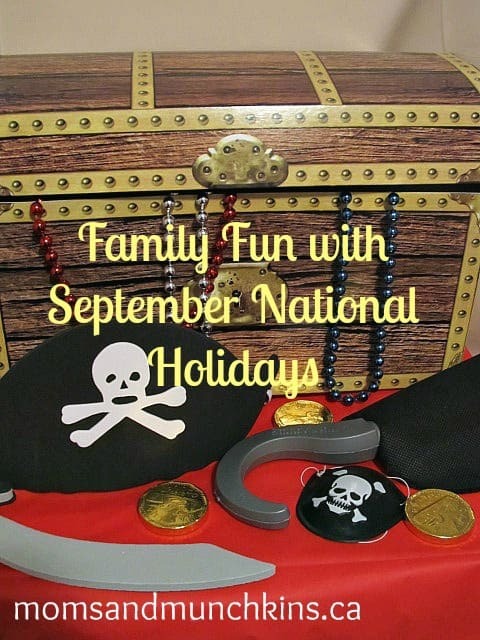 Spend the day talking like pirates and having a fun pirate treasure hunt at home. September 22nd – Car Free Day: This is a great way to get exercise, have a lot of fun & help the environment! Rather than driving the car today, try to get around all day using different methods like using your bicycle, skateboard, taking the bus and walking. September 22nd – Ice Cream Cone Day: What would the September National Holidays be without a day dedicated to desserts, right?! After all of your exercise from Car Free Day, why not reward yourself with a big ice cream for Ice Cream Cone Day! September 28th – Love Note Day (4th Friday of September): This is a great reminder of the importance of leaving special notes of appreciation for your loved ones! Use this fun holiday to leave special love notes around the house for your spouse and children. Your children will have fun creating special notes and hiding them around your home. September 29th – National Museum Day: This is a great day to plan a fun museum scavenger hunt as a family – click here for a free printable game! Do you know of any September National Holidays? Which of these September National Holidays is your favorite? Looking for more silly ideas for family fun? Follow us on Facebook, Twitter, Pinterest and Bloglovin’. *Visit Brownielocks & The 3 Bears for a full list of special holidays that you can celebrate with your family! She has the most complete list of holidays that I’ve seen. Who knew there was a salami day? It’s so hard to keep track of this stuff. Thanks for sharing this list! Talk like a Pirate Day? How funny! I will have to remember that. Thanks for sharing. Such fun times in September.